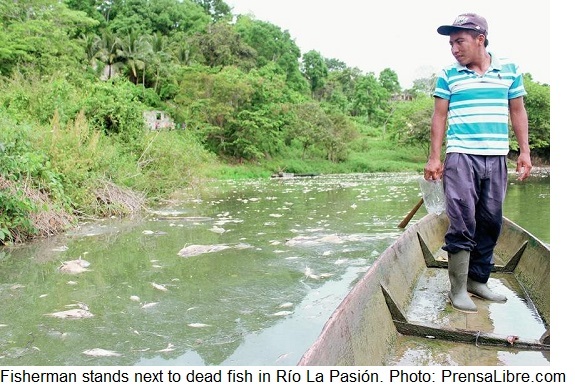 The Pasión River in northern Guatemala is a disaster area. 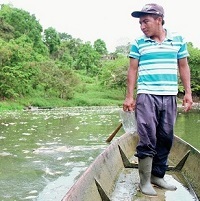 Beginning on June 6, residents along the river in the municipality of Sayaxché, Peten, began to find millions of fish, their primary source of food and income, floating dead in the river. The Public Ministry of Guatemala initially declared a red alert on June 11; days after the fish first began to appear floating in the river. The Public Ministry initially confirmed that the disaster was caused by run off of the pesticide Malathion into the river, but in the weeks after, they would take back the accusations against the palm company. However, these accusations were supported by a toxicological study preformed by University of San Carlos, which found elevated levels of the pesticide, and other agro-chemicals in the river. The report determined that the local palm industry was responsible for the contamination. The contamination affects 106 kilometers of river, and 65 communities. These poor communities have all been forced to rely more and more on the river for their sustenance because of the expansion of palm in the region. Communities have called on the government to perform an investigation into the pollution of the river. Late in the evening of June 23, nearly 45 members of communities along the Pasión River arrived to Guatemala City to denounce the pollution of their river. Following a late afternoon press conference, the community members began a sit-in outside the offices of the Presidential Commission Against Discrimination and Racism in Guatemala City to condemn and repudiate the contamination of their river by the palm company. They also demanded that the company be temporarily shut down for threatening life, and that they be allowed to be involved in the investigation of what occurred in Pasión River in order to ensure transparency. 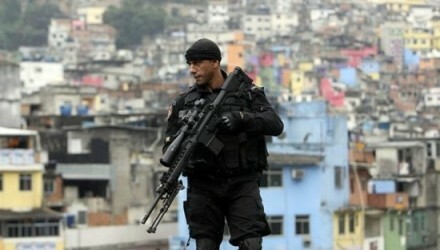 The following day, members of the Public Ministry visited the encampment. Community members expressed frustration at being treated with disrespect and contempt by the state and the firm. On June 17, the company, the mayor of Sayaxché, and community members gathered in Guatemala City to sign a document stating that the company “was not responsible for the death of the fish,” and that there “was no ecocide.” In exchange for the signing of the document, the company agreed to provide the communities with water, the improvement of town streets, and the construction of wells. REPSA is a subsidiary of the powerful Grupo Olmeca, Guatemala’s largest palm oil producer, which is owned by the powerful Molina family. The conglomerate was the first to begin the production of African palm in the late 1980s, and today cultivates nearly 46,000 hectares of land in Escuintla, Ocós in San Marcos, and Coatepeque in Quetzaltenango, and Sayaxché. Those affected by the pollution do not agree with this declaration. This isn’t the first time that communities in Guatemala have accused the palm industry of polluting their rivers. Communities in the Municipality Chisec, Alta Verapaz filled a complaint in the Guatemalan Public Ministry against the Ixcan Palm Company in 2013, for the contamination of their river. The following year, communities in Peten also filed a complaint in the Public Ministry against the pollution of their river. In both cases, the Pubic Ministry failed to investigate the contamination. The Public Ministry and Environmental ministry have called previous contaminations “accidents,” which have not resulted in new regulations. The failure of the government ministries to respond to the concerns of the communities has increased frustrations with the expansion of palm across the FRANJA of Guatemala, which stretches from Huehuetenango in the west to Izabal in the east. These frustrations have led communities to demand that the government begin to regulate the industry, and end the expansion. The first palm plants were brought to Guatemala in the late 1980s and have since spread like a virus across Guatemala and Central America. The expansion was strengthened especially in the years after the signing of the Central American Free Trade Agreement, which guaranteed multinational companies with security in their investments into sectors such as palm oil. The fruit of the palm is a high-yielding oil plant, which has gained a significant importance in the processed food industry. Palm oil production has spread because of the increased demand in the United States and Europe as vegetable oil used in a wide range of products including soaps and waxes, as well as popular food products such as Nutella, and Ben & Jerry’s Chubby Hubby Ice Cream. Increasingly the production has been promoted as a renewable biofuel, which has further brought people into the industry. The bunches of palm oil berries, commonly called Racimos, contain roughly 2,300 berries, and are harvested by hand. From there they are loaded onto a truck, and taken to the processing plant. The expansion has exasperated the crisis over land that has historically plagued the region; in Guatemala, 3 percent of the population owns nearly 85 percent of arable land. But as production of palm has expanded, small farmers have been pushed further and further to the margins.